The Georgia Rho chapter of Pi Gamma Mu will be hosting the 4th Annual Interdisciplinary Undergraduate Social Sciences Research Conference in October. 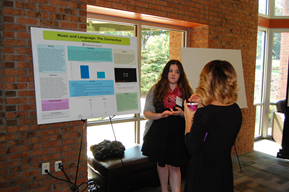 The event is a half-day research conference in which undergraduate students are invited to present their original research in the Social Sciences. This is a perfect venue for students to build their professional experience through a poster presentation of their work as well as to participate in networking and a workshop on professional development. This year the theme will focus on building better communication across fields of study. Registration for the conference is free and lunch will be provided. The event will be on a Friday and run from 9am to 1pm. If you would like to present a project. For those submitting a presentation for consideration, please include the title of your poster (12 words or less) and abstract (no longer than 180 words excluding tables/figures/references). Please do not hesitate to contact Dr. M. Katrina Smith with any questions you may have.